Metal cases with wheels use up most of your weight allowance before you start, while backpack-style bags usually have straps everywhere and don't cut it in a high-end hotel, never mind the boardroom. The team behind the Minaal Carry-On 2.0 Bag think they’ve got it figured out, offering a practical, multi-purpose piece of luggage that’s aimed squarely at those who spend a lot of time on the road. Others obviously agreed, with a Kickstarter campaign for the first version of the bag smashing through its funding goal. After a second crowdfunding campaign raised over $700,000, the latest version hit the shelves with several improvements to what was already an excellent piece of luggage. At first glance, the Minaal doesn't look much different to any other carry-on backpack. Made primarily from heavy-duty 600D Cordura fabric in either grey or "Aoraki black", with a minimum of straps and zips, the only visible branding is a discreet logo near the top. It’s not a bag that will be attracting undue attention. It’s not until you open things up that you start noticing the differences. The Minaal has a lie-flat design for its main compartment, making it more like a suitcase for loading and unloading. When you’re living out of a single bag, being able to pack and unpack quickly saves a lot of time. The suitcase comparison goes further than that, though. The backpack harness can be zipped away via a roll-out cover, leaving the Minaal looking like a large briefcase. While the ease of carrying the bag like this will depend on how much weight you've got it in, it's ideal for going through security, stowing in overhead bins and turning up to a business meeting straight off the plane. A second, full-sized zipped compartment is designed for electronics, with a floating sleeve that can handle both a 15” and 11” device simultaneously. The sleeve is suspended right in the middle of the bag, meaning that no matter which way it's facing when you drop it, your electronics won't hit the ground. Usefully, the sleeve can be removed from either the top or side of the bag, speeding things up at security. In the same compartment sits a multi-purpose section with space for your passport, business cards, and other items, a dedicated document sleeve, as well as a lanyard for keys and padded pocket for a cell phone. The whole bag can be covered by the included rain cover in a matter of seconds, and the pouch that the cover usually lives in includes a removable hip strap. That, along with the chest strap, comes in handy when the Minaal is being used as a backpack with plenty of weight in it, making it much more comfortable to carry. In terms of security, the zips for both main compartments can be padlocked together, although those on the two smaller front pockets can’t. Overall, the bag feels sturdy and well-made, and you can tell that the designers put plenty of thought into how it would be used. They've even gone so far as to produce a video for new owners to ensure they get set up properly, a welcome addition. Of course, any piece of luggage needs to perform well in the real world. To test the Minaal, I packed it with much of the contents of my existing backpack. The rectangular shape and full-length zips meant minimal wasted space, with even a pair of hiking shoes fitting comfortably in the main compartment. Several days’ worth of clothes, toiletries, and some miscellaneous items fit easily in the rest of the space, with electronics in the dedicated compartment. For a carry-on bag, the Minaal felt surprisingly spacious. 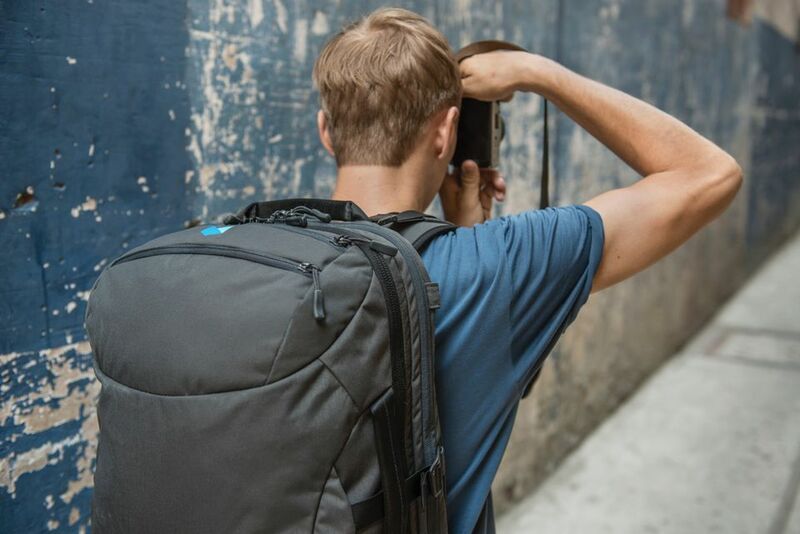 When used as a backpack the Carry-On 2.0 remained comfortable with around 25 pounds of weight inside, even when climbing stairs and walking around in the sun. It was equally usable in "briefcase" mode with that amount of weight as well, although you wouldn't want it to be much heavier than that. Taking things in and out was easy, especially with the separate section for electronics. Not needing to completely repack the bag after every security check makes a huge difference for frequent air travelers. The Minaal Carry-On 2.0 bag was a high-quality, robust piece of luggage for frequent travelers when it first came out, and it's only improved since then. It’s not the cheapest option out there, but the design and materials lift it above the competition. If you’re looking to travel with a single bag, whether it’s for a few days or several months, the Carry-On 2.0 should be right at the top of your shortlist. Dimensions: 21.65" x 13.77" x 7.87"